The Chinese government on Wednesday rolled out more details of the building work it is undertaking in the disputed South China Sea, listing lighthouses, communications stations and other facilities for civilian and emergency use. 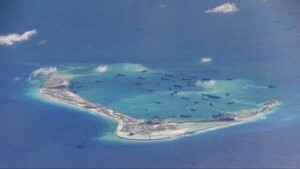 China stepped up its creation of artificial islands last year, alarming several countries in Asia and drawing criticism from Washington. There have been recent tensions between the Chinese navy and the U.S. military around the Spratlys. China, which said this week some of the reclamation work will be completed soon, says the construction on the islands will help with maritime search and rescue, disaster relief, environmental protection and offer navigational assistance as well as have undefined military purposes. The country’s top planning agency, the National Development and Reform Commission (NDRC), said in a short statement it had drawn up a plan for the use of civil facilities on the Spratly Islands. These facilities would help improve living conditions there and also fulfill China’s international obligations on environmental monitoring, disaster relief and navigational safety, the NDRC said. Large lighthouses for navigation are included in the building plan, along with base stations for wireless navigation equipment, weather stations to monitor for tsunamis, scientific research stations and equipment to tackle oil spills, it added. Facilities will also be provided for the supply of search and rescue ships and places for fishing boats to seek shelter from storms and undergo repairs, the NDRC added, though did not specifically mention what sort of harbors or docks would be built. In order to protect the environment, waste water and garbage handling facilities will also be built, the NDRC said. It did not provide a timeframe for when these facilities would be completed and nor did it name the specific islands they were being built on. Recent satellite images have shown a hive of work on China’s new islands. U.S. officials say China has reclaimed 1,500 acres of land this year alone. Military facilities under construction include a 3,000-metre (10,000-foot) runway and airborne early warning radars, which could be operational by the year-end, according to one U.S. commander.